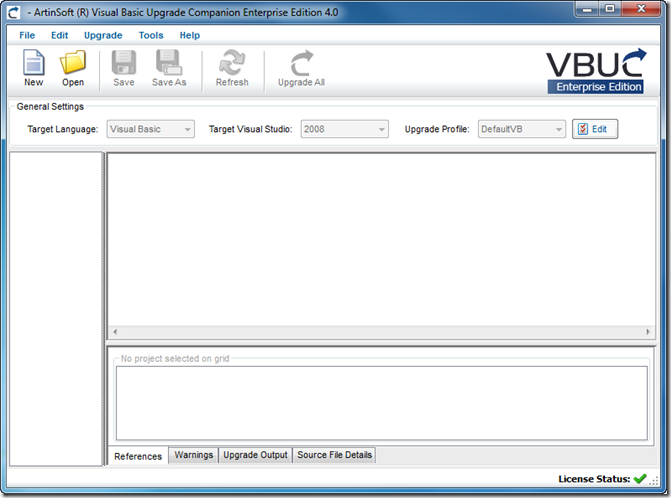 We are very happy to announce the Visual Basic Upgrade Companion 4.0 Beta. You can now download a trial from the Trial Request page. While we complete beta testing, we’ll have both version 3.0 (current release version) and the 4.0 Beta available for download. If you have the chance, we would really appreciate it if you could download the beta, and send us any feedback either through ArtinSoft’s regular support email (support@artinsoft.com) or through my blog Contact Form. Increased productivity for migration projects, with features such as improved conversion of ByRef/ByVal parameters (specially when working with Windows APIs), TypeName/TypeOf support, improved default property conversion, generate code to explicitly release COM objects when required, and hundreds of smaller enhancements and bug fixes that greatly improve the conversion of VB6.0 code. Improved the user experience by adding localization/internationalization for German and Japanese and completely redesigned the installation and license process. Installing a license is now a straightforward process (no more copying files!! ), and it is now possible to install and execute the VBUC on both 32- and 64-bit versions of Windows Vista and Windows 7, as well as 32-bit Windows XP. The installation requirements were also greatly simplified, so you don’t need Visual Studio installed to install the VBUC (though it is still recommended). You can now also select the target version of Visual Studio to generate the appropriate Solution file (*.sln). 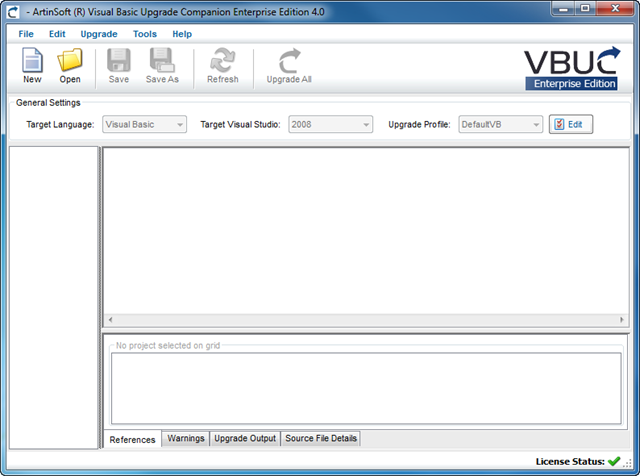 The VBUC can generate Visual Studio Solutions for version 2005, 2008 and 2010. Enhanced Grid migration, by mapping the Microsoft Flexgrid and APEX/ComponentOne TrueDBGrid to a grid that extends the native .NET DataGridView. It will no longer be required to purchase a third-party grid solution when moving from these grid to .NET if you wish to move to 100% native .NET code without using COM Interop. Improved assessment capabilities, by improving the accuracy of the VBUC Assessment Mode and making additional changes so members without specific mappings are tagged with an EWIs – in the past only members that were explicitly tagged as “Not Mapped” had an EWI. You can read more details on the new features of version 4.0 in this page: What’s new in VBUC 4.0? Make sure you try out these new features by downloading a trial. and also note the license icon at the bottom of the window.